At this point in your long history of eating donuts, chances are you've seen more than a few unique varieties of the sugary dough rings, such as the abominable cinnamon bun donut, or the elusive Reese's Peanut Butter donut, or maybe even the famous cronut. Well, here's a new one: boozy donuts that come with a shot of whiskey. Seriously, in real life. Habit Doughnut Dispensary, the booze-serving establishment that slings some of Denver's best donuts, offers a variety of donuts that come infused with shots of liquor like whiskey, vodka, rum, or pretty much whatever you want. 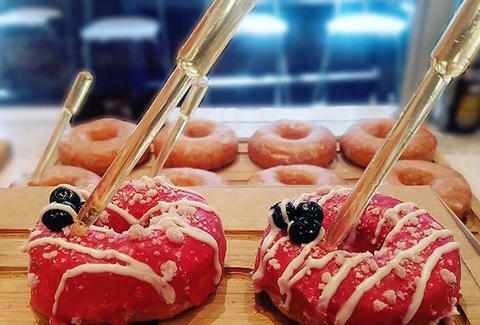 The donuts come served with a plastic pipette (one of those science class droppers) of your booze of choice stuck right in the top, which you can remove and drink as you eat. Previously, the place served the booze in shot glasses on the side, according to the shop's manager, Hayley Charles. "The pipettes were debuted approximately four months ago although yes, we have had alcohol shooters alongside our doughnuts since the beginning of Habit time," Charles said via email. "In terms of availability, we can essentially do anything you want, that's the best part about it! Carbon Cafe & Bar (sister to Habit Doughnut Dispensary) has a full bar so any alcohol a customer wants infused into their doughnut; whether that be vodka, whiskey, rum, etc, we got it covered." Adding a shot your donut is a $2 up-charge, which is actually super reasonable. The most popular combinations, according to Charles, are the Plain Jane and Blazed infused with Fireball, the new French Toast with whiskey, the Carbon (chocolate and espresso) with Kahlua, and the signature Habit Jumbleberry with vodka. Damn, do they sound good. This is all to say that the next time you bring a box of donuts to share at the office, you better bring a bottle of whiskey to share, too. It's simply the right thing to do, folks. Tony Merevick is Cities News Editor at Thrillist and loves both donuts and whiskey. Send news tips to news@thrillist.com and follow him on Twitter @tonymerevick.